Need a simple way to make cats in your shelter healthier and happier? Installing portals between two existing cat cages is an inexpensive way to update your single cage cat housing to spiffy double compartment condos, which benefits cats by keeping food, bed and litter separate and allowing cleaning and daily care with minimum disruption. Order your portals today. We no longer produce portals ourselves. Instead, we’ve teamed up with Shor-Line, who are manufacturing and selling improved versions of the portals (they now come with spacers to bridge the between-cage gap!). You can find ordering information here. You will need to add the portal to your wish list and call Shor-Line at (800) 444-1579 for a price quote. Allow 2-4 weeks for delivery of the portals and template. Please email dcwagner@ucdavis.edu if you have any problems placing orders. 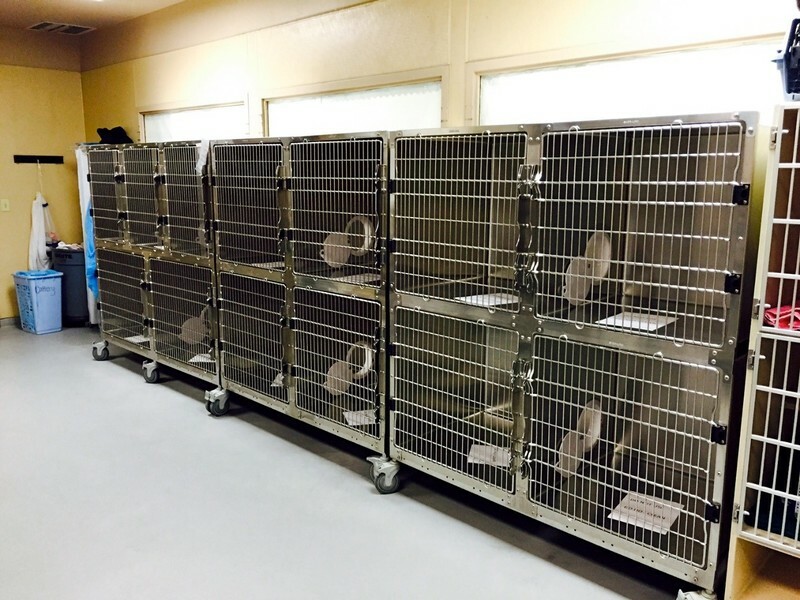 Cat portals can retrofit into older cage housing to help meet standards of care for short-term housing of shelter cats. 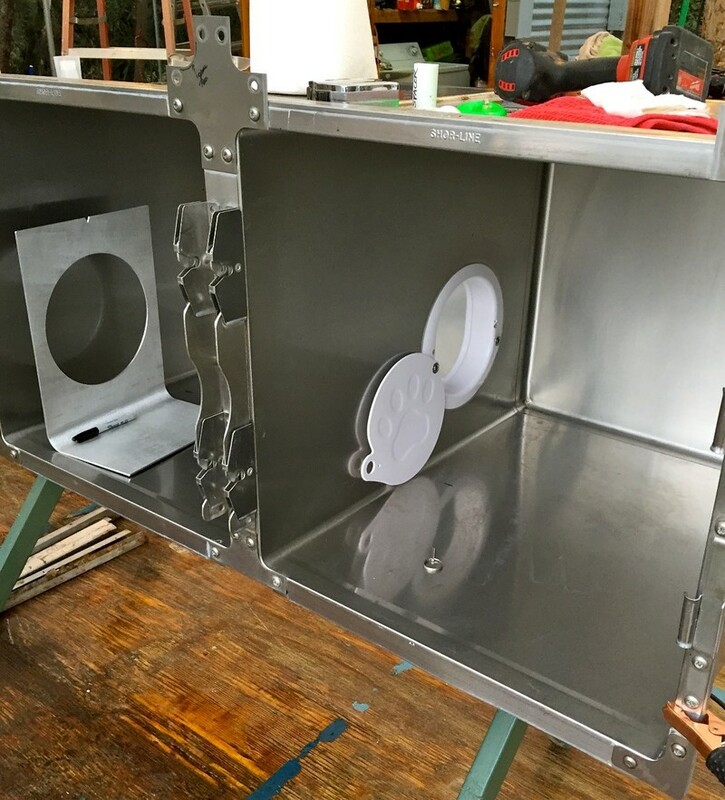 These portals will fit in cages that have a space between cages that ranges from around 2" to 2.75" - this should be most stainless cages and most fiberglass cages. 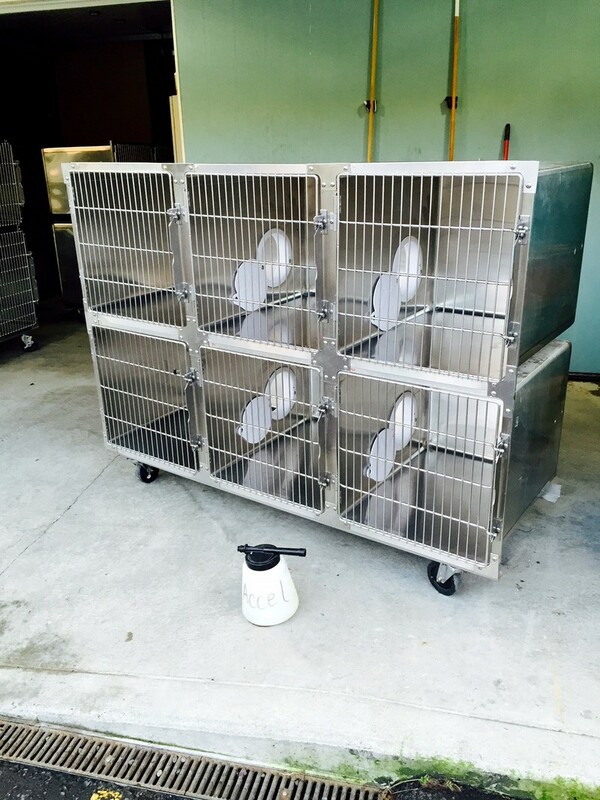 If the distance between your cages is less than 2", please contact dcwagner@ucdavis.edu before ordering. Portals are designed to be installed vertically in the wall to make a double compartment cage side to side. Note: Although the portal was designed for side to side install we have had a shelter install it up to down in stainless steel caging. Recommended minimum cage size for installing portals is 2'x2'. 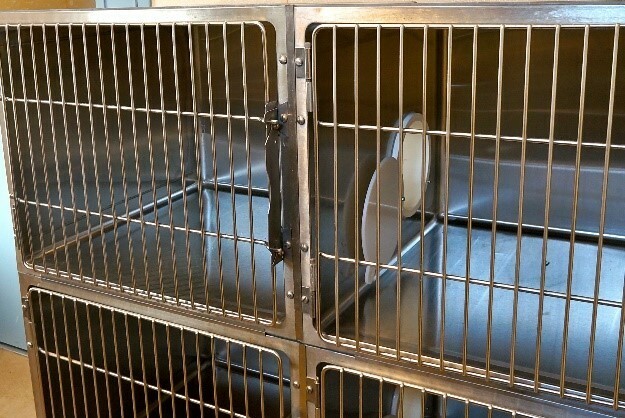 The best cage-type double compartment housing that provides adequate space for an adult cat can be made from 30" or 36" cages connected together. Seal the portal to the cage wall during installation using 100% silicone sealant to insure efficient and effective cleanability. Portal pass-through opening is 7.5", portal flanges cover to 9.5". Portal doors can be locked - this allows single cage use when absolutely needed. All metal hardware is stainless steel. Durable with all common disinfectants and designed to be easily cleaned. Still want portals but would prefer to make them yourself? This can be done. 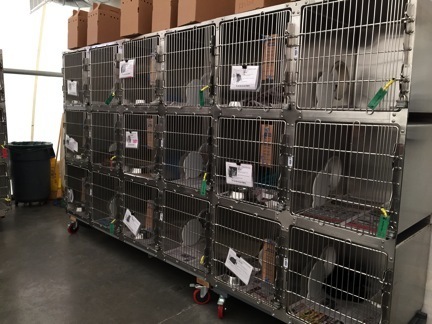 See our information sheet on Making Double Compartment Cat Cages using a PVC Portal. Holes will need to be cut in cages in order to place the portals. Shor-Line offers a template that works well for cutting stainless steel cages with a plasma saw. The template could also be used to mark the cage wall for cutting in other manners. We have had people cut their metal cages with metal shears (hard but doable) and nibblers (we love nibblers). We currently use a Hobart 250 ci machine as our plasma saw. The other is to peel apart your banks and put them back together to make cage banks of pairs of cages. Here is a bank of 12 and a bank of 6 side by side (2x2 cages). New bases can be purchased from cage manufacturers or they can be made - as was the case with the cage bases pictured below. Most of the hardware for connecting cage banks can also be purchased from the manufacturer. Configure your cage banks prior to portalizing. Our favorite cage bank setup is a double-stacked unit that is elevated off the floor (cabinet or drawers underneath can be great for storage of items used for cage setup). Read these instructions in their entirety before installing the portal. These portals are relatively easy to install but getting the first one in correctly will help to insure the others are indeed easy. These are 10 minutes each - sorry about that. We will perhaps make a new one some day - but did this ourselves after the portals arrived - hang in there and try not to get too sea-sick. Most of what you will need to know for installation is in here - especially for steel cage installation. Good luck! Stainless steel cages can be cut with a plasma saw and a template or a nibbler and a template. The video below shows how to cut the cage walls with a plasma saw. 1. Installation timeframe: If cages are set up and ready for portaling, and you've got a template and a plasma saw, the cutting of cage walls should take about 1 minute per cage wall - same for using template and nibbler. Portal installation will take about 5 minutes. Sealing the portal with 100% silicone sealant may be the longest part of the process - taking about 5-10 minutes. Total installation per portal, depending on the method used for cutting, should be in the 10-20 minute range. The first portal will take a little longer – but subsequent portals should fall in this timeframe or less. If installing the portal is hard, something may be wrong - contact me at the above email address and I will help troubleshoot. Spacer to hold cage walls apart at appropriate distance. You must use spacers that fit the cage gap - without spacers the door will not work as designed and will be at risk of breaking. Template for cutting holes – not absolutely needed but sure makes it easier to cut holes consistently in the right position. WARNING: It is extremely important to use spacers even when it seems like the walls are pretty solid and stiff. One spacer per portal is ok, 2 spacers per portal is better - locate them at approximately 9 and 3 (clockface) or thereabouts. The portal when tightened (just enough to hold it in place - don't overtighten) will tend to pull the cage walls together. If you have appropriately-sized spacers, the portal will tighten to the spacers and the cage walls will not be pulled in - all is good. Without spacers, the portal will tighten to wherever the walls give to, and this ultimately affects where the portal door will rest when it is in the open position (which is where it will be most of the time). Without spacers the open portal door will tend to hit the vertical wall or somewhere near the bend of the cage wall/floor which tends to push the door away from its parallel alignment with the portal. This can strain or bend the door at the hinge point - and result in a broken door - something you will want to avoid and which can easily be prevented by using spacers. Assemble the bolt, washer and nylon threaded sleeve. 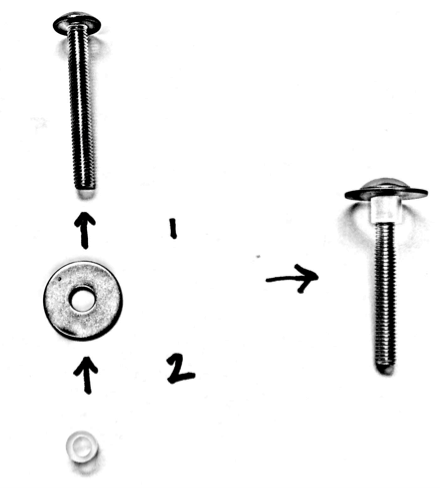 Take the bolt, add the washer and then thread the sleeve up the bolt until the sleeve holds the washer relatively tightly against the back side of the bolt head – one assembly will serve as the hinge point for the door, the other will be the door stop. 2. Using a Sharpie, mark a dot on the cage wall about 1” above the center of the cut circle or if using the template put the dot at the “V” notch in the template. This dot will be used to help visually orient the portal perpendicularly in the cage. Insure that holes line up from side to side to allow portal to slide in. 3. 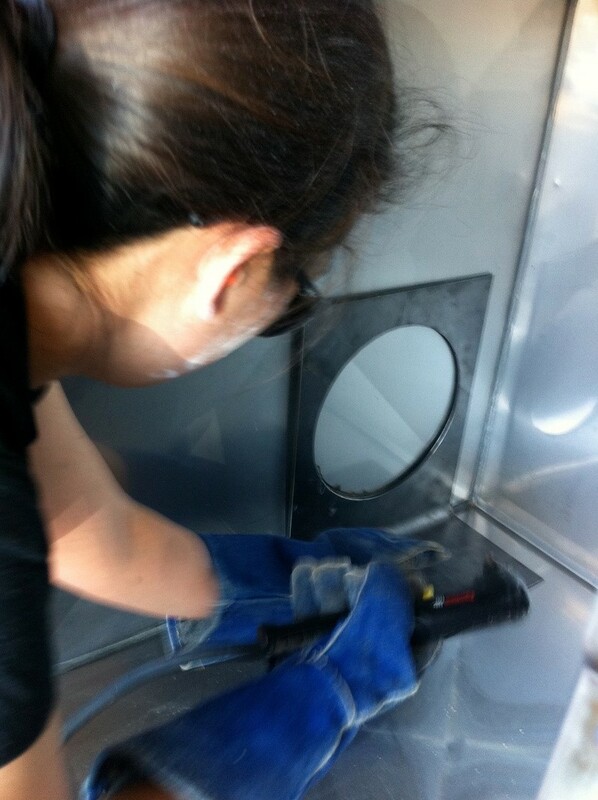 Stainless steel cages can be cut with a plasma saw and a template or a nibbler and a template. Recommended portal location in ~28” deep standard 2’ x 2’ cage: ideally 14-15” from the front for portal placement near the rear of the cage, or 3-5” from the front for portal placement in the front of the cage. Portals at the rear of the cage are easier for cats to move across when doing daily cleaning (less need to handle cats). Using our template and marking the cage floor at 14” from the cage front will place the portal at 15” into the cage. This works well. In 24" deep cages, template placement at 11" into the cage works well (if using our template, measure and mark at 10" into the cage for template alignment). 4. Orient the two halves of the portal such that the arrow (inside the flange – points to divot on flange) points up. The portal can be installed from the left or right - the hinge point and doorstop are interchangeable. Note however that there is only one correct orientation upwards – the arrow along with the small divot on the portal marks the top of the portal. 5. Door location can be in either the left cage or the right cage. The side where the door is desired will need to have the portal half containing the 6 holes. 6. After the cage is cut - test fit the portal into the cut holes. Orient the portal properly with the arrow/divot marks upward, the portal half with 6 holes on the side where the door is desired. Then slide one side into the other. The portal should fit into the hole easily with about ¼” space all around. 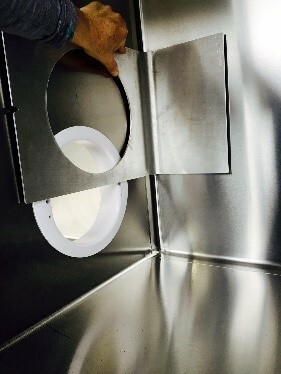 If the portal is tight or getting caught on the cage wall, investigate the hole alignment and cut more as needed, as long as there is room for the flanges to cover the cut opening. 8. Prepare for install - make sure the cage wall is clean before installing the portal by wiping the cage wall with a paper towel or cloth with denatured alcohol to remove any dirt/grease. 9. Place the appropriate-sized spacer(s) between the two cage walls. Two spacers is best - at 9 and 3 o'clock. The spacer should be the same length as the between-cage distance. Many stainless steel cages are about 2.25” apart. The spacer included in the hardware pack is 2.25”. You will need to make enough spacers that fit your between-cage "gap" distance for the number of portals you are installing. 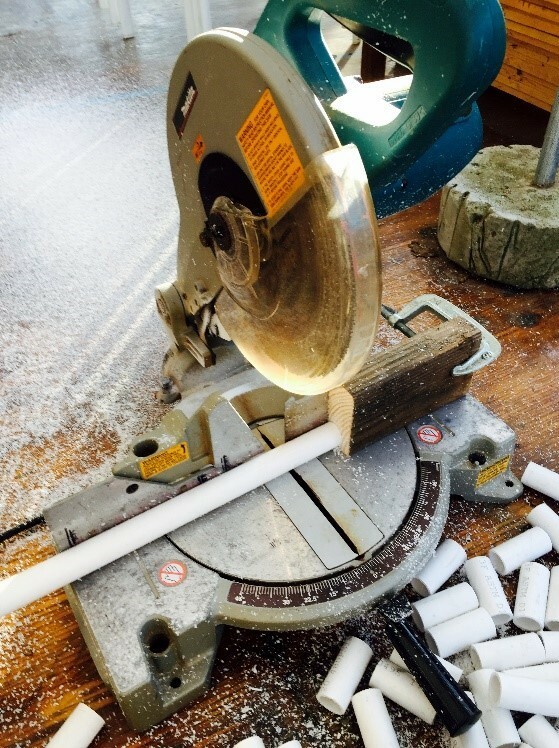 You can use ¾” or 1” PVC pipe. 2x4 wood will also work. Simply cut the pipe or wood to the distance between your cage walls. Always install the portal using spacers to maintain the appropriate-sized cage gap. 10. Most of the time the spacer will just sit in place while you place the portal - if it is loose in that space, move the cage walls closer together and use the spacer to push them apart. If that fails, check to make sure you are using the correctly sized spacer. If you are, then use double-sided tape or something similar to get the spacer to stay in place while you install the portal. 11. 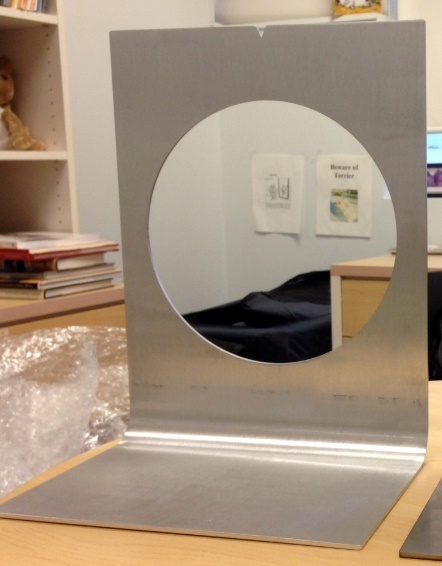 Prepare portal halves for install: lay each portal face down so you see the back side of the portal flange. Place an 1/8” - 1/4” bead of 100% silicone sealant about ¼” back from the edge of the flange – run this continuously along the interior of the flange on each half of the portal. It is easiest/cheapest to use caulk gun with larger silicone tube here. 1 silicone tube will provide enough silicone for about 25 portals. 12. Return to the cut hole in the cages and slide the portal halves into each other from their respective sides. (Make sure the arrow and divot are at the top of the portal). Make sure the portal half with the holes is on the side where you want the door. 13. Slide the portals into each other and snug to the cage walls. Use the metal screws (2) – one on each side of the portal – to connect the portal halves, using only the MIDDLE set of holes of the series of 3 holes. Tighten only until the flanges and the wall meet. Occasionally there will be a gap between the cage wall and the portal. No worries - snug up the portal, but don't over-tighten; silicone will seal this gap. Check the rotation on the portal such that the divot on the top of the portal visually aligns with the sharpie dot on the cage wall. When they are lined up, the portal will sit properly in the cage - perpendicular to the cage floor. If you have the template, you can use it additionally to align the portal. Check both sides of the portal to insure everything is aligned and tight. 14. 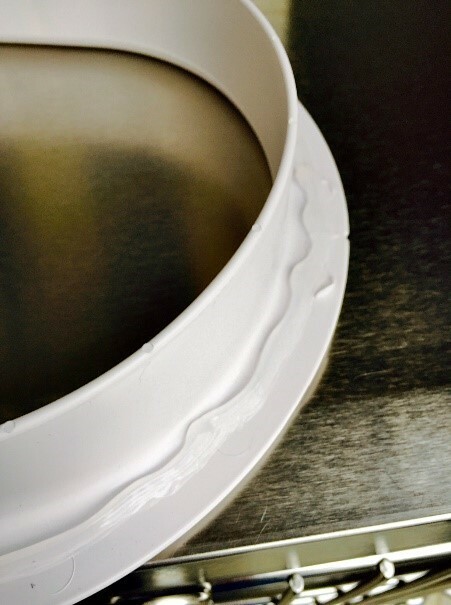 Wipe away any excess silicone that has come out from behind the flange and onto the cage wall with a dry paper towel - use mineral spirits sparingly to clean up any residual film if needed. 15. Attaching the door (Note: the door is the same on both sides). Orientation of the door: when the door is open, the paw print should be upright. When the door is closed, the paw should be upside down. The idea is that the door will look most correct when it is open- as it should be the majority of the time when a cat is housed in a double-compartment cage. Place the door so it is in this orientation when installed. 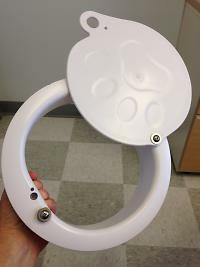 Take one of the assembled bolt, washer and nylon sleeves and insert it through the hole in the door away from the thumb. Insert the bolt into the lowest hole on the portal on whichever side of the portal the door will be mounted. Start threading the bolt into the portal by hand. There is a nut inside the portal to catch the bolt. Ideally screw the bolt in with a phillips screwdriver but if installing more than a few portals you will want to power drill these in, as they are long. When you reach the end, gently tighten them down until there is just enough tightness so that the door will maintain its location when let go of. If the bolt loosens and the door becomes too floppy you may wish to use Loctite on the bolt threads to maintain desired tightness. 16. Use the other assembled bolt, washer and nylon sleeve in the other side of the portal’s lower hole as the door-stop. Do not over-tighten the assembly; it just needs to sit snug against the portal surface. 1. Using 100% silicone sealant (smaller silicone tubes work well here - 1 smaller tube will seal about 5 portals), place an 1/8" bead of silicone along the edge of the portal flange as it meets the cage wall. Smooth the bead with your finger to insure any gaps or spaces are filled and the edge is relatively smooth to the cage wall. Use a paper towel to clean the silicone off your finger tip after each pass of your finger on the silicone bead. This will help to make a nice smooth surface on the silicone. Do this on both sides of the portal. 2. Using the same silicone sealant, place a small ~1/8” bead of sealant continuously along the junction/edge of the overlap. Use the same technique as above to smooth the silicone and wipe away any excess. 3. Use mineral spirits sparingly to clean up any silicone smudges on the cage wall. 4. Fill the middle hole with silicone sealant- the one that was used to connect the portals together. This is a large hole and filling it with silicone will prevent dirt from gathering there and will make overall cage cleaning easier. 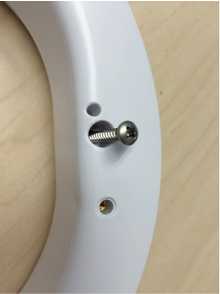 Leave the small hole open – it accepts the locking pin. 5. Depending on the cure time of the silicone, let the cage sit until the silicone is cured (usually up to 24 hours). 6. Clean the cage with soap and water and/or disinfectant prior to use. Shor-Line offers an aluminum template that works well for cutting stainless steel cages with a plasma saw. The template could also be used to mark the cage wall for cutting in other manners (we have had people cut their metal cages with metal shears - hard but doable - and nibblers, etc.). Our templates are made of aluminum. Call Shor-Line toll-free at 1.800.444.1579 for pricing. Templates can be made locally too: have your local metal shop make a 90 degree template out of a sheet of metal (steel or aluminum) 10 3/4" wide with a base of 7 1/4" and 14 1/4" high. Have them cut an 8 3/4" hole with the bottom of the hole 3" off the bottom of the template and centered such that each side of the cut out is 1" wide to the edge of the template. Note: make a rounded bend at the 90 degree angle so the template will sit close to the cage wall. How to make a raised cat bed for a portaled cage. How to make a portal out of PVC pipe. How to make cage curtains to reduce cat stress. Huge kudos to Rob Williamson (Alfalight, Inc, Madison, Wisconsin) for countless hours of engineering and design work on the portal. With your help and expertise, we were able to make this thing happen - thanks Rob!! !